Today in this post I will tell you how you can send personal email newsletter. There are lots of service (like FeedBurner) lets you send email to your subscribers but they use RSS feed to generate newsletter and in case if you are looking for service which lets you send email to your subscribers whenever you want and whatever you want. Then there you have TinyLetter. For instance If you want to send personal email newsletter to all your friends and family but don’t want to use any normal email service (like Gmail or Yahoo! Mail) or if you are celeb or known by many people who like send personal email newsletters to their fans and all. You can simply send newsletter whenever you have something good or useful to say. TinyLetter lets you send email newsletter to your subscribers for free. You simply need to go to TinyLetter.com choose your desire username which will be used in the URL by which people will subscribe to your newsletter (e.g. 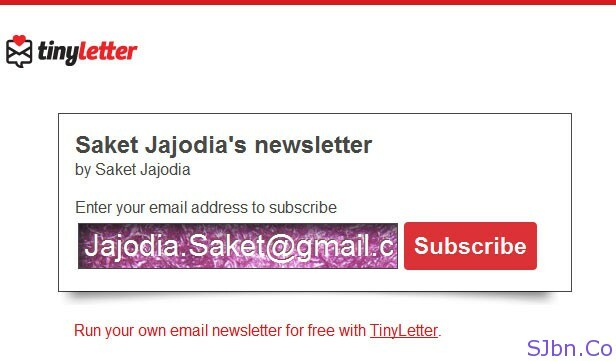 : I choose SaketJajodia as my username and my URL is tinyletter.com/SaketJajodia). You can share that URL on Facebook, Twitter or with the people you know, if you are owner of a blog or website then you can embed a signup form to your newsletter (see demo below). If you have list of email address which you would like to add in your subscriber list then you can even add up to 25 email ID/day. They have very easy to use UI and email editor (by which you can create your newsletter) with rich-text and HTML support. The email newsletter will be sent to subscribers using TinyLetter email address and your subscribers can reply to you with through that newsletter without knowing your actual email address. If you want your new subscribes to receive any of old newsletter which they haven’t recive then you can simply go to Old newsletter page and resend the email to all your new subscribers. You will able to a stats about know how many people have opened your email newsletter. If you want you can ask people to pay to subscribe for your newsletter and also give them one month free trial with it. For instance you can ask your subscribers to pay $6/month. When subscribers will sign up for newsletter then they will be taken directly to PayPal payment page, they will able to pay directly to your PayPal account or if you want you can collect your income to TinyLetter’s PayPal account and latter you can request TinyLetter for issue the payment to your PayPal account. TinyLetter will not charge anything from you (it’s totally free). If anyone wants to unsubscribe to any newsletter which uses TinyLetter, then in ever newsletter you receive there is an unsubscribe link at the end of the newsletter or if anyone smapping using TinyLetter service then you can ask TinyLetter to remove you from that newsletter and they will take a look into their newsletter to conform if that sender is spamming or not, if that sender do they will immediately close that account.